3) A pack of 500 leaves cover 39.5 sq.ft. Patent gold leaf, also referred to as transfer leaf, is gold leaf mounted to special tissue paper by a pressure process. A book of patent gold leaf is assembled by placing each unit of gold leaf and tissue paper between pieces of thin rouged paper. The gilder can then be remove one leaf at a time without disturbing the remainder leaves. This term applies to gold leaf which is selected for it’s higher quality having fewer pinholes and irregularities. A book of loose gold leaf is assembled by placing each piece of gold leaf between pieces of thin roughed paper. The gilder can then remove one leaf at a lime without disturbing the remaining leaves. It is removed from the book with a gilder’s tip, a flat natural hair brush. We sell both Avery and Arlon products. Komacel® is a particularly robust integral skin-foam sheet made of sold PVC according to the Celuka process. Komacel® has a smooth, firm outer skin with a silk gloss finish; this makes it especially suitable for screen printing and it has quickly become recognized as a superior material for the advertising industry. Komacel® vinyl sheets are also used for all industrial applications where resistance to dampness, weathering and aggressive substances is required. If you need a thick, weather resistant, durable sign blank which will take paint or vinyl letters, we will cut your blanks to size. Add 10% to the above prices. Komacel® is a very hard, rigid, high density, weatherproof white foam vinyl sheet which ideally can be used in signs and display work. Also ideal for glass co.’s for use in windows and parapets. Building contractors and carpenters can use for bathroom counters, walls, panels, etc. Samples, more literature, and working directions will be supplied on request. PolyCarve is a high-density, rigid thermoplastic formulated to provide the best physical characteristics for the type of laminated sheet used in the modern signmaking processes. During the coextrusion process, a high-strength skin-to-core bond is achieved which won’t peel, crack, or chip during routing or engraving operations. Today’s signmaking technology, with its computerized routing and engraving techniques demands materials that can be machined, welded, and fabricated to perfection quickly and easily…and with a minimum of finishing. Finished PolyCarve signs can take any punishment the weather or climate can dish out. UV-stabilized PolyCarve resist fading and will not delaminate. Not only do PolyCarve signs take sub-zero cold, they also take heat, rain, and wind. Users can expect years of trouble-free service in any climate. All are 1/2″ thick, and all are priced at $6.02 per square foot. Signmakers need a tough, strong material that won’t chip or peel during routing. And since so many of today’s applications are for outdoor use, finished signs and billboards must be able to stand up to a wide range or environmental conditions. 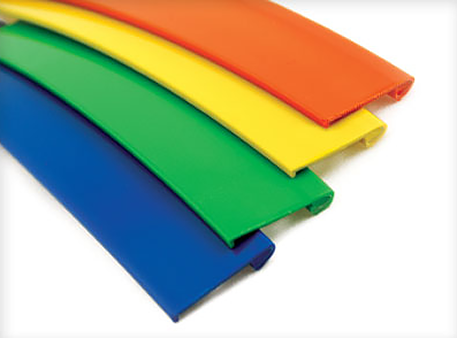 Signmakers also need a versatile thermoplastic sheet that will provide them with the most design and graphic options. PolyCarve is a unique nonstick, nonabsorbent material that helps protect against damage from markers or spray paint. Graffiti wipes off in seconds using the appropriate cleaning solution. Outdoor signs are especially vulnerable to knocks and bruises from people as well as from nature. Impact-resistant PolyCarve won’t crack or chip, so it’s perfect for thwarting the sticks and stones of mischievous vandals. PolyCarve is also ideal for store fronts, storm door panels, public restrooms, office partitions. Samples and factory brochures are available upon request. Contact us for more information. Any comination of products from the above lists amounting to over $200 will be shipped U.P.S prepaid anywhere in the U.S.A.